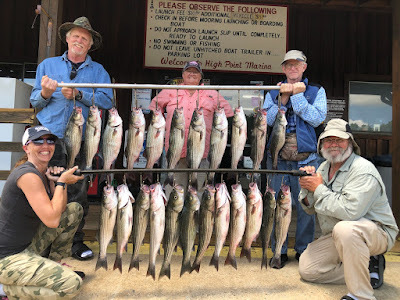 Lake Anna Striper Guide Journal: Lake Anna Stripers are Rockin! Tony took his clients out this morning and put them on these nice Stripers. Summer fishing on Lake Anna can be incredible as you can see by this picture and all the pics I post on my daily journal and on Facebook. My guides and myself work together to constantly put our clients on Stripers and for them to have one of the best days of fishing that one can imagine. It is not uncommon in the summer to go out and catch 50 to 100 Stripers a morning. Yesterday I went through 300 baits by noon....that is a lot of action! Although we are booked for Fathers Day a fishing trip makes a good present and lasting memories. Contact us to reserve your special day on the Lake catching Stripers with Lake Anna Striper Guide Service, you won't regret it!